For the love of the game and their own kids, David and Marcia Emerick have been leading the North County Junior Golf Association since the '80s. 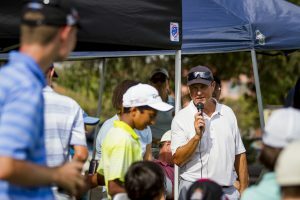 The NCJGA mantra - "It's All About the Kids" - is evident at every event they host, be it a fun tournament for beginners on one of San Diego's great short courses or a two-day qualifying event for national tournaments. Be sure to visit the ncjga.com website for tournaments as well as fun Camps and Clinics throughout the year.